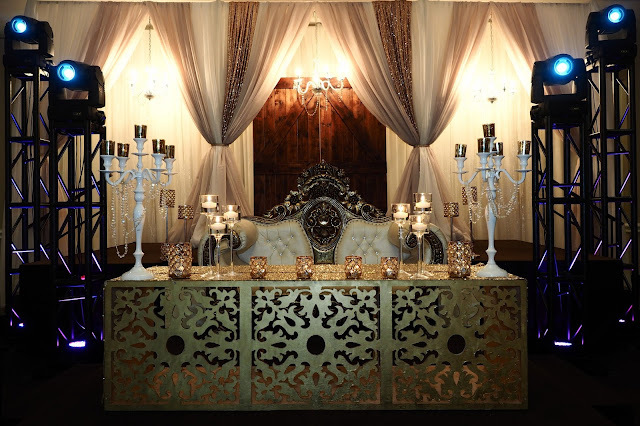 Faudia & Tony's Guyanese Wedding on July 1st & 2nd at the Renaissance by the Creek was a huge hit, where Trade Sensation Events had the extreme pleasure in executing their Decor Design & Setup. With the Bride & Groom's super creative & organized Wedding Details for Decor, we have collaborated ideas to bring fourth their unique visions which showcased Rose Gold, Blush Pink & light touches of gold & Ivory for a Modernized-Rustic Charm & Shabby Chic setting. With many meetings & incredibly detailed choices of props & pieces to tie in this look, we are so excited to see how beautifully everything came together, successfully! Congratulations, Faudia & Tony on your beautiful journey together! Thank you for making Trade Sensation Events a part of your Big Day!